Join us for a complimentary clinic, sponsored by Palmetto TRIbe. Palmetto TRIbe’s USAT Certified Coaches will lead attendees through proper transition mat setup, followed by a course familiarization “jog-through”. The course familiarization will include guiding athletes through key course areas and transition. Athletes should wear running shoes to the clinic. This event is free and no registration is required. Meet at Night Heron Park next to the stage. 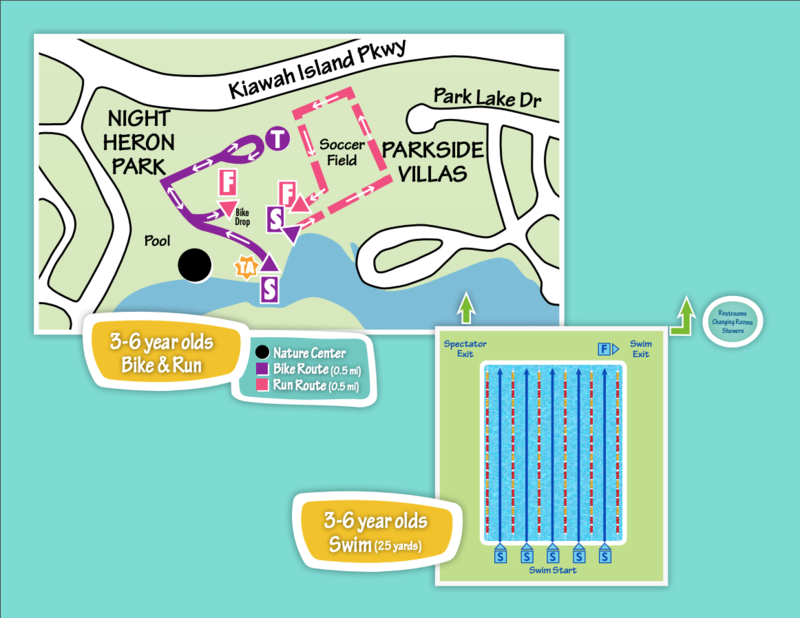 We are excited to announce that the Kiawah Kids Triathlon is now a United States Triathlon Association sanctioned event. Annual membership to the USTA is available and required at registration. Everyone is welcome to join USAT, and all youth memberships are valid for one year. For more information, please check out USAT’s website. Saturday, April 20th, 12:00pm – 2:30pm, Night Heron Park, Kiawah Island. Athletes will receive a bib, bike number, shirt, wristband, timing chip, and body marking at packet pick-up. Please have your child wear the wristband on their left arm so they can be easily identified by age group on the course. Chip and timing bracelet should be on their right ankle. Please remember there is a charge for lost chips, so please return chip at the finish line. Bicycle (road bike, mountain bike or beach cruiser) or tricycle. Training wheels are allowed for any age group. No scooters permitted. Various size beach cruisers are available for rent through the Recreation Department. Bike helmet with working chin strap – check your helmet for proper fit! Swim suit (arrive in your swim suit) or Tri suit. Water shoes (i.e. flip flops, sandals, crocs) if needed for traveling from swim to TA (pavement and mulch). Shorts and shirt if not using a Tri suit. Water bottle, hat and towel. Race bib – pinned to the front of the shirt you will be riding and running in. Parents are asked to write their cell phone number on the back of the bib. The TA (Transition Area) is the area where athletes transition between the swim to bike and the bike to run. Race day the TA will open in advance for athletes to set up their bikes, helmet, clothes and gear. Parents may assist their athletes in setting up their TA pre-race. TA will close to parents 15 minutes before race start. Triathlon staff and volunteers will also be on hand to assist with TA set up. Athletes are welcome to decorate their TA spot with a balloon, ribbons, etc. in order to assist them in finding their spot during the event, as long as decorations do not interfere with or impede other athletes. Upon completing the bike portion, athletes will dismount their bikes at the OFF MY BIKE sign and head into the TA. In the TA, athletes should park in their designated spot. Our Triathlon staff, lifeguards and volunteers will be on the pool deck for questions and assistance. The race will start ‘in water’, no jumping or diving into the pool. No running on the pool deck at any time. Parents and spectators may cheer on athletes from the viewing area on the side of the pool. 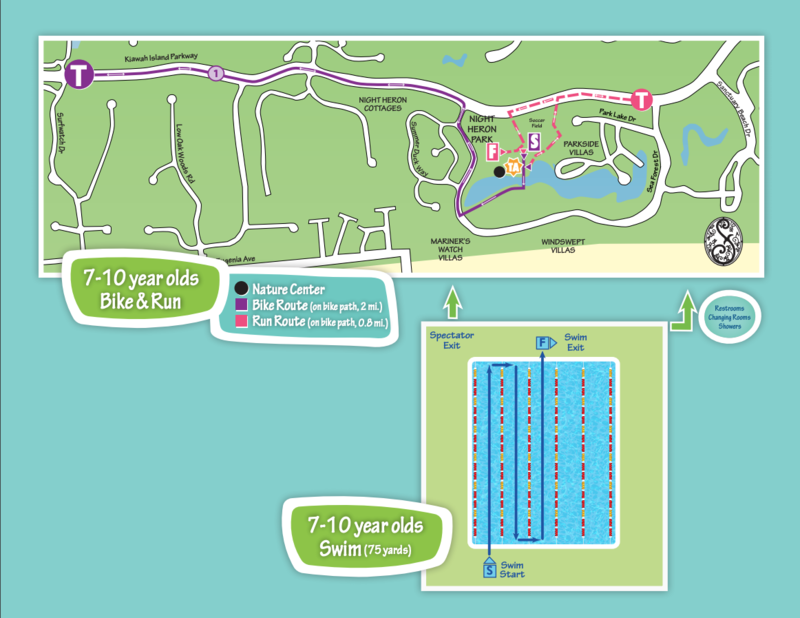 Athletes in the 3–6 age group will be accompanied by race staff while in the pool. Life jackets, kick boards, water noodles, puddle jumpers and water wings are permitted for 3 to 6 year olds. No artificial propulsive devices such as fins, paddles, or gloves may be used. Signs, cones, and race staff will direct participants out of the pool and into the TA. Training wheels are permitted at any age. Glider and balance bikes are permitted in the 3-6 age group only. Helmets must be buckled before taking the bike from the TA and must remained buckled until returning to the TA. Race bib must be visible on the front chest area of each participant during the bike and run portions. No riding bikes in the transition area. Athletes will be directed to the on my bike sign, located outside the transition area. Triathlon staff reserves the right to disallow any bicycle deemed unsafe. Any unusual bicycle must be approved by race officials prior to competition. Riding on the right side of the bike path. Passing on the left of the slower cyclist. Passing cyclist only when there are no oncoming cyclists. Respecting any safety instructions given by deputies, race officials, or volunteers regarding oncoming bicycle traffic or car traffic at cross streets (7-10 and 11-14 age groups). Riding in a straight line without swerving, veering, or blocking the forward progress of other cyclists. Race officials may remove any cyclist who appears to ride or behave in an unsafe manner. 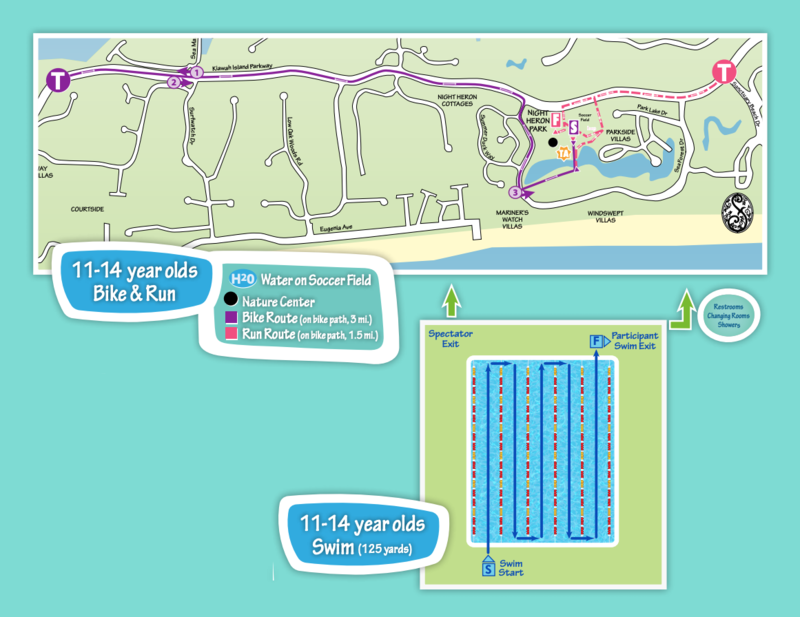 With the 7–10 year olds and 11-14 year olds, parents and spectators are not allowed on the race course at any time. Parents of 3-6 year olds may walk or run alongside their cyclists, while being conscientious of other athletes. In the 7-10 year old and 11-14 year old age groups parents are not allowed on the course at any time. With 3-6 year olds, parents may run with their athletes, although we ask they be conscientious of older athletes attempting to pass. Multiple age groups may be on the run route at the same time; athletes must be courteous of others. In the 7-14 year olds groups, parental assistance is not permitted on the race course or in the TA once the race has begun. No personal audio devices or headsets may be used or carried during any portion of the event. Finishers may not retrieve gear until all participants have finished the cycling portion and have begun the run. In the events of cancellation, refunds will not be given.